The power box is a self regulating rectifier with an internal current and voltage storing capacitor. Connecting directly to the alternator, the output is approximately 15 volts with no current being drawn and 14.5 volts with some load. These values are just right for charging a 12 volt battery or running the electrics direct. The unit has been designed using the latest power technology semi-conductors to provide stable, direct current from standard permanent magnet alternators. Three types are available: Single phase, Bi phase and Three phase. Some are available with a charging lamp control, or lighting delay circuit, which prevents the lights being turned on until after the engine is started. Ensure you have the desired unit before fitting. Single phase and Bi phase units control 200 watts and three phase units control 300 watts. 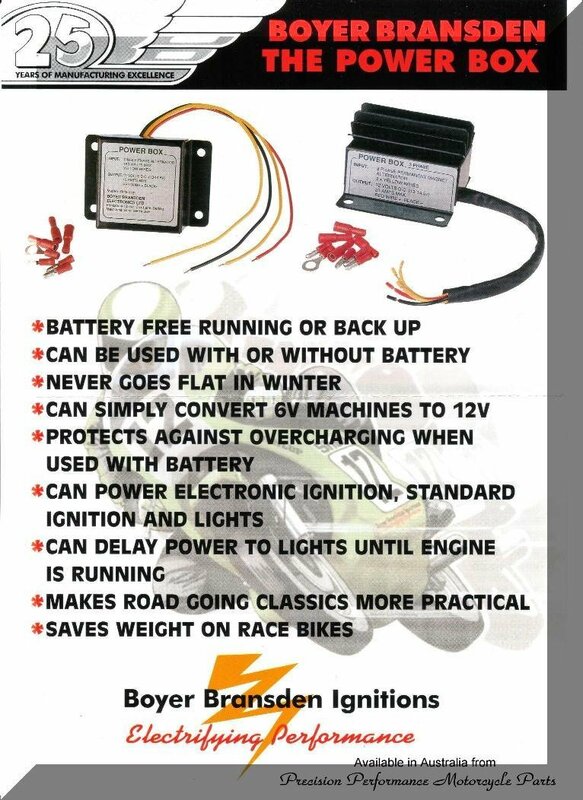 As a rule of thumb Single phase power boxes are suitable for use with most British Bikes, pre 1975 with alternators two, or three wire. Bi phase are suitable for use with most Italian and French machines equipped with three wire alternators. Three phase will suit some British machines post 1975 with three wire alternators and the majority of Japanese three wire machines. For further info go to the Boyer site. There are distinct advantages to doing this. Original looms had circuits, relays, safety devices, checkers and stuff that did their job back then. Time, vibration, water, oxygen and irregular maintenance have all compounded producing electrical systems, already lacking good fusing, that will provide you with endless hours of frustration. I rip them all out. Can’t be bothered with the drama. Make them new. Myself. With central blade fuse box. 1 for each circuit. I get a new system. Custom designed for whatever I need. Easily modified. New cables. New connections. Soldered. Crimped. Isolated. And I know what I have. Diagnosis become heaps easier. First time you’ll freak. Second time you’ll wonder why. Here is one of the best. An all rounder. If you can look at this and understand it you will know more about original electrical systems than most. It is elegant in its simplicity. Plug and play. Except for some peripherals it’s all there. Thanxs Jayel. Simple to adapt for pretty much anything. The only thing simpler is total loss. Good earth connections. Check your brushes. Maintain your battery. Fuses. Note that if installing coated bars you may have problems starting. Check your kill switch earth connection. No earth. No go.